Costa Del Mar Reefton Polarized sunglasses are great for any occasion. The elegant color combination of Blackout and Green Mirror Glass W580 Polarized makes this pair a great addition to any outfit. Made from Tr90 and with a 2 year warranty, these stylish sunglasses are perfect for a day in the urban jungle, hiking or hitting the beach. 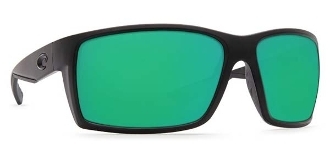 Blackout Reefton Polarized are truly a must have accessory.